When you change this top it's so much more fun. You can buy these tops on ebay. 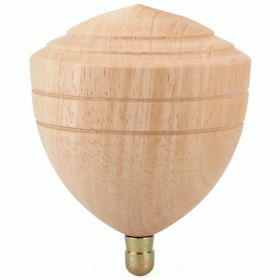 And if you want to do tricks - put the tip in a drill and modify it to look like a Spintastic C tip - a little bit bigger. I would love to try them!! How do you search on eBay for those?? Also... Any chances to get the shape printed to replicate this top design??? 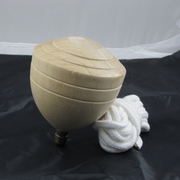 Traditional Taiwan Chinese Wood Spinning Top Large tall 5 inches === ebay. This is a good way to start off on big tops. Should I buy the one you told me?? Or is Just the very same one?? 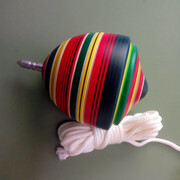 What string and une (tricks, target, long wire walk...) do you recomend for each of them and also... whitch string? paracord for both of them? Thanks for sharing this valuable sapience!! Yes buy the 5.0 inch. Then maybe put the tip in a drill and file for the V shape. Then use 1/8 camo cord about 10 feet long with a 1/16 loop at the end for attaching at the crown. I would prestain and stain it. Then come to San Jose, and I will crack it in half. Yes buy the 5.0 inch. Yes Im getting the big one!! Then maybe put the tip in a drill and file for the V shape. I guess this will provide longer spin times, rigth? Then use 1/8 camo cord about 10 feet long with a 1/16 loop at the end for attaching at the crown. I would prestain and stain it. ROPE: I When you say camo cord you mean paracord in camo colours rigth? Also.. does the prestain and stain... helps for the winding/trowing? Then come to San Jose, and I will crack it in half. I would love you to crack it!! But first let me play a little!!! 50 FEET POLYPRO CAMO CORD 1/8 # 4 IS WHAT I BUY. This is good fighting line and does well on tricks. This line only works if you turn the body down. Just bought a new one on ebay. I just put a stain on it made a 1.0 crown from a dowel and glued it on. I took a hand drill to the tip with a file, and left the body alone. Hits target good, and tricks good. Video on the way. I'm hoping this one will hit a target at 26 feet. This is fun top throwers should try it. This is an old video. Thanks you so much cecil!!! I'll order it at some point during the spring and try it out... That modification is right up my alley.. Question tho. How do know where do add your weight to balence it ?